This fantastic 1 bedroom, with pool and sea view is situated in the desirable Villa area of Golden Sands. Close to local bars, restaurants and shops and around twenty minutes drive from Varna international airport, the apartment has everything you could want in a self catering apartment, satellite TV, fully fitted well equipped kitchen, bathroom with shower. 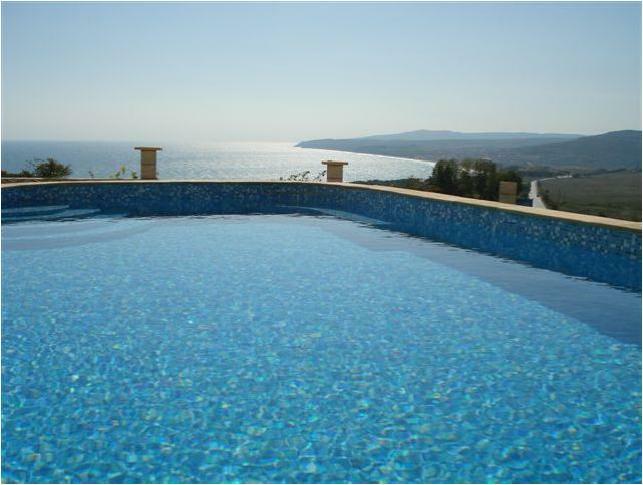 The apartment is located in Alen Mak, a lovely resort situated between Varna & Golden Sands. It is fully furnished with air conditioning, TV and a well equipped kitchen. The Bathroom has a shower, toilet and wash basin. There are plenty of restaurants, bars & shops close by and the main resort of Golden Sands has something for everyone with beach activities and markets throughout the day and many bars, restaurants and clubs in the evening. You could also try your luck at one of the many casinos too. The (Aquapolis) water park is a short taxi ride away, and a fun day out for young and old! The Bulgarian national cuisine is excellent with numerous top-class restaurants, taverns, and cafeterias scattered throughout the resort. The shops and markets in Golden Sands sell everything you could imagine including designer labels. Cabacum beach is a small costal resort near Golden Sand, and has its own sandy beach, bars, cafes and restaurants. You can walk from Cabacum into the main resort of Golden Sands. Golden Sands is the second largest beach resort along the black sea coast. There are again a fantastic range of shops, bars, restaurants and discos here, and you can spend hours wondering around the main commercial areas. The main attraction though is the beach – 4km long with soft “golden sands” and gently shelved shore. The resort lies at the foot of the Zlatni Piasatsi nature park, where virgin forests descent right to the resort centre. There are loads of other activities to do on Cabacum beach or Golden sands, such as diving, parasending, jet skiing, water skiing, voile ball and jeep safaris. Just 3 km separate Cabacum Beach from the popular resorts of Golden Sands and St Konstantin and Helena. The excellent location of the resort provides for easy and fast access to Varna and already benefits from a modern transport infrastructure. A short drive can take you into Varna City. This extremely cosmopolitan city and is filled with pavement cafes and designer boutiques. For culture-vultures, the Archaeological Museum boasts “the oldest gold in the world”, a collection of manufactured gold pieces dating back to 4500BC. Art lovers will enjoy visiting the City Art Gallery and the Museum of Art and History, as well as several other specialist museums in the city. Apart from being a beach resort, Varna rivals the great cities of Sofia and Plovdiv, in its offering of cultural attractions and historical buildings, museums and art galleries. It also provides access to some of the quieter scenic spots along the coast, including the nature reserve of Kamchiya, the royal palace of Balchik and the hillside monastery of Aladzha... A truly perfect place for relaxation and rejuvenation!